Merhaba, bu kez iç mekan fotoğraflarıyla karşınızdayım. Ankara'da geçen hafta hava çok soğuk olduğu için resimleri dışarıda çekmeyi başaramadık:) Süslü otelimizin içini de görmüş oldunuz böylece:) Vintage görünümlü midi eteğimi bej rengi sade bir bluzla kombinledim. Bu kez soğuğa karşı botlarımı giymeyi tercih ettim. Çok sevdiğim deri yaprak kolyemle görünümü tamamladım. Oldukça sade ve 50'li yılları andıran bu görünümü ben çok sevdim. Umarım beğenirsiniz. Yorumlarınızı bekliyorum. Hi dolls, this time, we took our photos inside of our hotel in Ankara because it was freezing outside:) I'm sorry about the background:( In this outfit, I wore my vintage checked skirt with a beige top. I preferred to keep myself warm that's why I chose to wear my booties. I finished this 50's simple look with my favourite leather necklace. I hope you like it. Waiting for your lovely comments. skirt is amazing, wish I had a Mango near me! Nice skirt, plaid is so trendy for this season! Let me know and I'll follow back! Nice looks on this blog!!! What about following each other? Visit my blog and let me know, it would be great to keep in touch! Nice look! I like it you skirt! Great look, I like skirt:) A. Very pretty! i'm your follower number 279! thanks for your comment! Love your outfit and your boots!!! I have them too, but in brown, and I show them in my blog today! :) Hope you visit me! Hello, ya te sigo guapísima. Me encanta! Creo que no me atrevería con una falda así, pero tú estás monísimaaa! What a pretty outfit! Your skirt is just gorgeous! I like it !! beautiful skirt ! Hello dear, I also already follow you, my name is Pamela and the photo I have in my hand a butterfly. I hope you can see me! Lovely look, as always. I love that skirt on you. And your booties are amazing. love the long skirt and the modern wedge heel!! I loved your blog,,,, I just found out,,, YOU STILL FROM RIGHT NOW,,, follow me you me??? Lovely look,you are so beautiful. I HAD to comment this look! Maybe you know it from my posts, but I love vintage pieces so much and this skirt is just perfect, especially the lengh of it. I really really wish I had it too! Hello beautiful! You can see in my list of blogs that I follow. I also do not appear to follow me. Do you speak Spanish? Guapa, ya me apareces en GFC, gracias! Estás preciosa con el look de hoy. You look lovely! 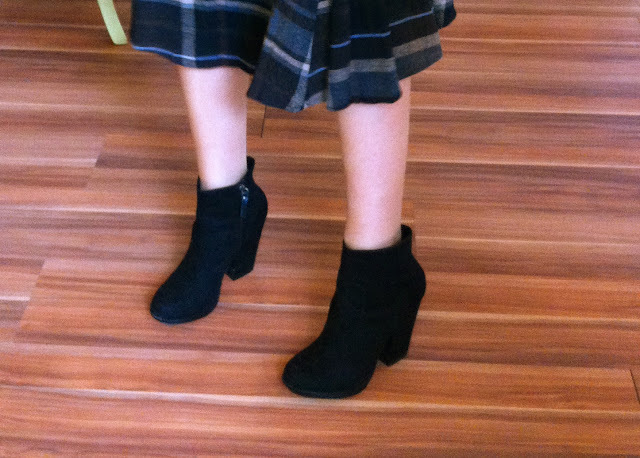 Really love your skirt and shoes! Following you on GFC and Bloglovin! Wow you look very pretty! Kiyafetin cok guzel!! Aww, very cute!! Love your hair!! Love the whole look and hair is just beautiful! I love this skirt!!! It's really amazing!!! Love the look! I love this look. The skirt is great and looks perfect on you - I wish I could pull off that length. your plaid skirt is adorable - love it! i love your black shoes and the whole outfit is very good. thanks for the love, I'm following you now! WOOW so gorgeous! nice blog! Very cute look! Love the necklace! Hi! I love your blog, so I’m a new follower! I invite you to my blog, I hope you like it!! we follow you right now! lovely 50's outfit! your booties are perfect! hope to see you soon in our blog! WOW!!! AMAZING! Lovely post & lovely blog!!! You look so pretty in this skirt ! Fun post! Great pieces. I love your shoes! thank you for following me on gfc! I followed you back now too. You look so great, girl! You look so gorgeous! I love your hair. :) That outfit is too cute--definitely very 50's. I'm especially digging that pretty printed midi skirt (I really like the flare of it) and your classic black ankle boots! Buon giorno il mio amico è venuto a ringraziare la vostra visita, siamo rimasti soddisfatti con le sue parole. Vi auguriamo una splendida settimana con tanto amore e tanta pace. Love ur blog dear! Would you like to follow each other?